The six-mile-long Balboa Peninsula is a neighborhood of the city of Newport Beach, easily reached from West Balboa Boulevard where it crosses the Pacific Coast Highway. 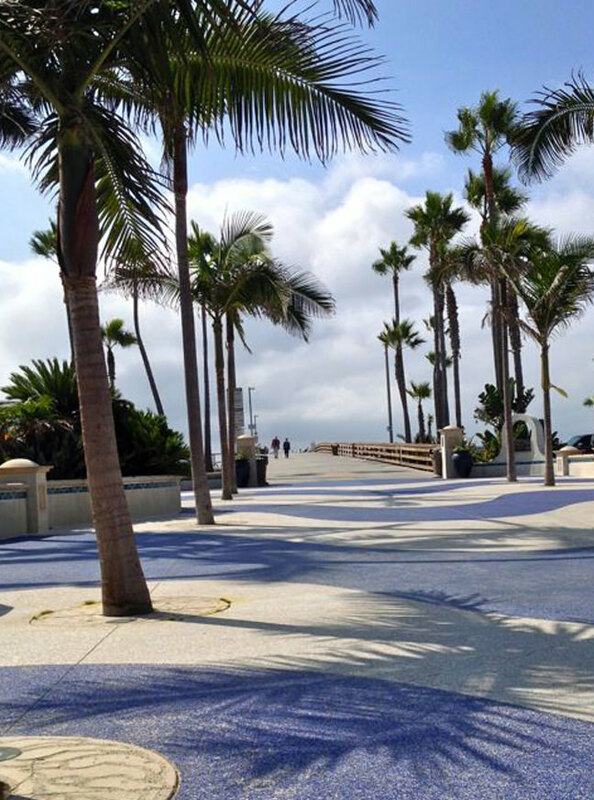 Newport Balboa Promenade •Trailhead: Western end: 36th St. and W. Oceanfront. Eastern end: E St. and Balboa Blvd. •Length: Over 4 total miles •Typical Width: 4 ft. & above •Typical Grade: Level •There's a steep incline at Newport Pier. •Terrain: Hard The eastern end of the oceanfront promenade begins at E Street, then travels nearly three miles up the peninsula to 36th Street. The smooth concrete pathway parallels the beach; along the way you will see some shops and restaurants, but mostly houses. Balboa Island Promenade •Trailhead: Agate Ave. and S. Bay Front (ferry terminal) •Length: 1-2 total miles •Typical Width: 4 ft. & above •Typical Grade: Level •Terrain: Hard A nearly two-mile-long promenade travels the perimeter of Balboa Island, although it is interrupted by stairs in a few spots, so wheelchair riders will need to navigate some side streets. Accessibility: •Beach Wheelchair: Yes •Available on a first-come, first-served basis at the lifeguard headquarters at the foot of Newport Pier; 949-644-3177. •Accessible Parking: Yes •On the peninsula: Free accessible spaces are in the lots serving Peninsula Park at A and B Sts., and at the Balboa Pier metered lot at Palm St. •Several city lots along the beachfront have accessible parking that's half-price for those with a disabled parking placard. Metered street parking is also available. On Balboa Island, a designated accessible space is at the corner of Marine and Park. List of city lots. •Accessible Restroom: Yes •Along the promenade at Balboa Pier, Newport Pier, and 15th St.; there are no stall doors. •Accessible Picnic Tables: Yes •At the south side of Newport Pier and at Peninsula Park, where you have to travel across a very firm, short stretch of grass.